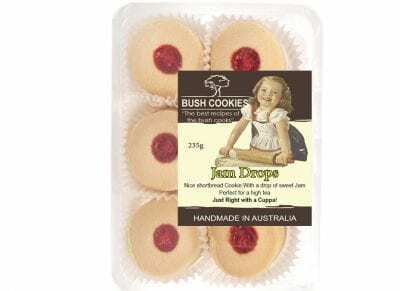 Basically a plain shortbread cookie with a sweet jam drop added. These cookies are widely enjoyed, a favorite for gourmet gift baskets especially at Christmas time and are also becoming popular in discerning cafes who prefer to offer something nicer as a complimentary cookie instead of tiny mini bite sized biscuit. We deliver wholesale orders freight free to grocery retailers and cafes in major metro regions. Order now from our parent company’s wholesale online fine food store Opera Foods (register and log-in to see wholesale prices).